For the second time in as many days, I'm headed into Anchorage. Last night my wife and I attended the Wells Fargo Iditarod banquet at the Sullivan Arena. It was terrific. Our favorite Iditarod mushers, Aliy Zirkle and her husband Allen Moore (who recently won the Cooper Basin 300, go Allen), were gracious enough to sit at our table. Both are funny, wonderful people. They own and operate the Skunk Place Kennel in Two Rivers, Alaska. Last year my wife, Becky, was lucky enough to win a spot as an Iditorider, i.e. she got to ride in the ceremonial start, about twenty miles from downtown Anchorage out to the Campbell Airstrip. She rode in Allen's sled and had a great time. The day before the Ceremonial Start, Aliy and Allen took my son and I for a sled dog ride around Campbell Airstrip. 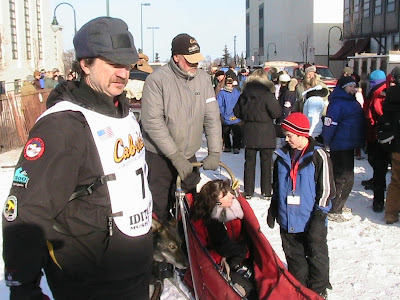 Think about that for a minute, the very next these two were about to embark on a epic dog sled race 1100 miles from Anchorage to Nome - and they took time out of their training schedule to give an eleven year old kid and his drooling fanboy father an hour long ride with their championship teams. Yeah, did I mention they are incredibly nice people? This year's race start is tomorrow, we'll be out there cheering them on. And Sunday is the restart (the real start of the race, on Nancy Lake about 40 miles north of my house here in Palmer). We'll be there too. Expect pictures. Anyway, I'm headed back into Anchorage this morning to meet regular commenter Tania for lunch at the Moose's Tooth. I'm looking forward to it. Expect pictures (With Tania's permission, of course). Before marrying someone who doesn't like the cold, my brother wanted to move to Alaska. He even has two huskies (rescue dogs) and had an Alaskan Malamute (who died at an unfortunately young age) because he's fascinated by the Iditarod. Hey, Aliy is my favorite musher. I still have the copy of Sports Illustrated Women that she was in. But, because I'm generous I will share her with you. Lunch was good, company was better. Lunch had a BONUS - Becky was there for a few minutes, but she had to run.